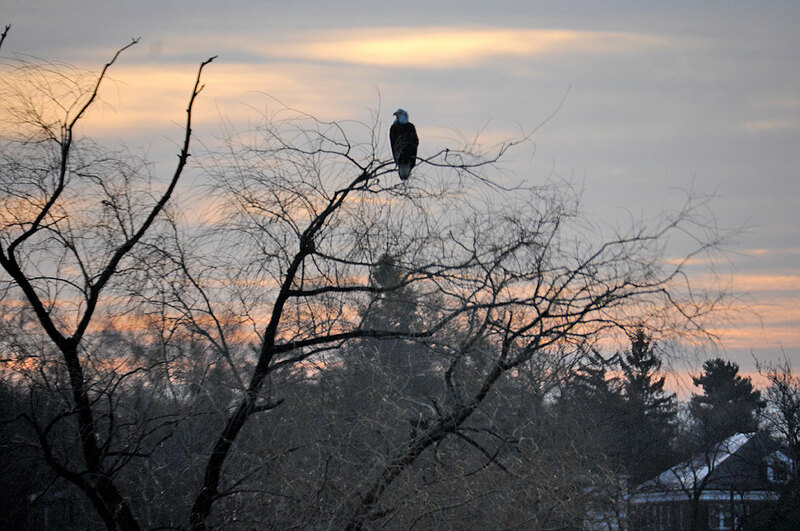 A Bald Eagle in Boston? The prospect seemed rather unlikely. After all, this is not Idaho. So when our intrepid copyeditor came back to the office after her morning walk around Jamaica Pond claiming that she had seen a “Bald Eagle,” we were like, “Riiiight.” However, Carolyn does know her common finches from her yellow nuthatches, so we decided to pack up some equipment and head to the Pond the next morning to see whether she has been spiking her morning cup of joe again or what. As it turns out, Carolyn was right! 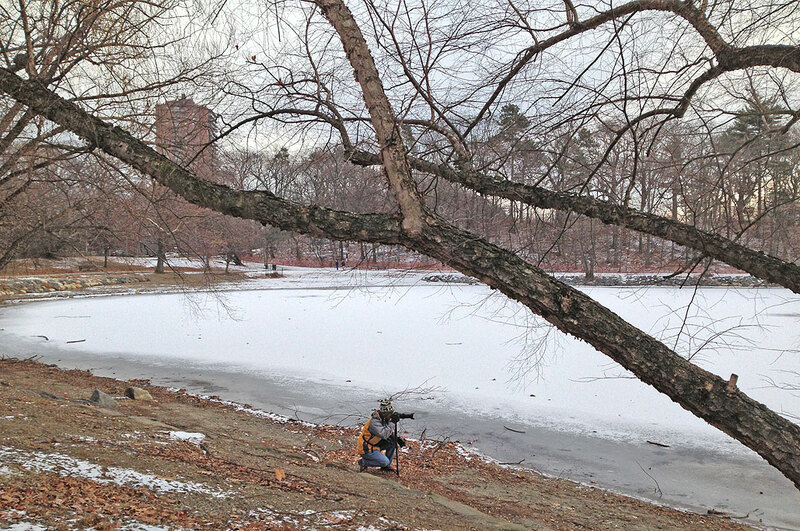 There IS a Bald Eagle hanging out at Jamaica Pond, and it is a beauty. We spotted it surveying the area from the upright tree on the Pond’s teeny tiny island. It was quite an impressive sight. Next time we will position ourselves with the sun to our backs so we can get some brighter shots of Bald Eagle. We spent a few hours following the bird around. Every time we got close enough (50 yards?) to get some clear shots, he would take off; our yellow jacket may have freaked him out. As a result, most of the shots were taken from across the pond with a 300mm zoom on a monopod. We managed to to get close enoug to get some details, but not close enough to get them sharp. Tracking him at full zoom was definitely a bit tricky! 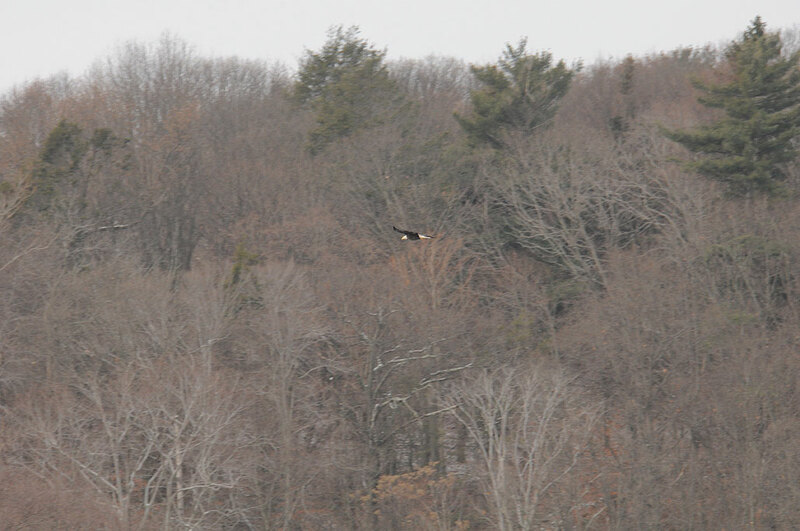 Here is a 100% crop of the bald eagle in flight at about 50 yards out. The Nikon Image Stabilization worked reasonably well even at the extreme end of the Nikkor 18-300mm zoom range. Jamaica Pond is part of the Emerald Necklace of parks created by the great American landscape architect, Frederick Olmsted. It was created by a retreating glacier and is the largest fresh water pond in Boston. The pond apparently was skate-able in the past, but has not been for many decades. With the temperature in the teens, there was a layer of ice on the surface. While strong enough to support a goose, it looked much too thin to support a person. Still, much of the pond was covered in ice when we were there in the morning. At the island end of the pond are a few drainage pipes with some in-flow to the Pond. This was where the swan, ducks, and geese gathered. While it was one of the few liquid water spaces available to them, it could also be because there is safety in numbers. A lone duck or goose would certainly be easy pickings for the Bald Eagle circling above. The Bald Eagle was feeding on something earlier. We didn’t see it, but bird bits were scattered along one of the banks as well as on the ice. 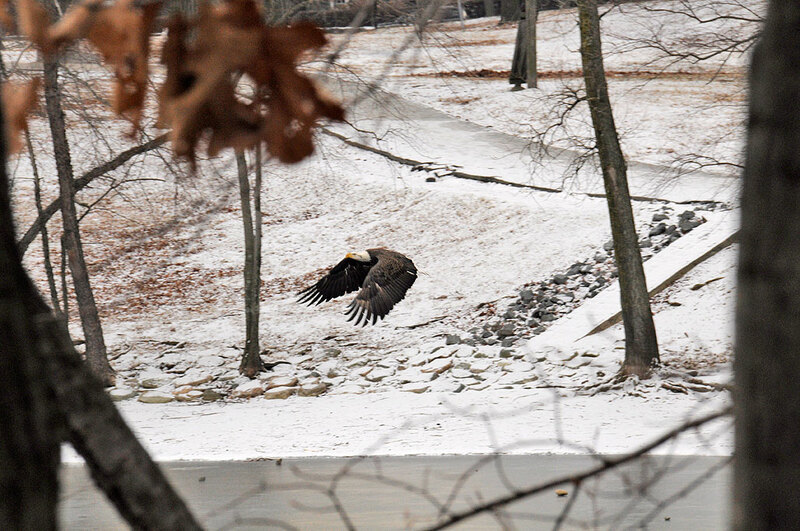 We’re sure how the waterfowl would feel about it, but we would be excited if this Bald Eagle decides to claim Jamaica Pond as its new home. A Bald Eagle in Boston, who woul’ve thought we could enjoy such a sight. We hope the bird does decide to settle down at Jamaica Pond, but even if it does not, perhaps it will make it a part of its territory. In any case, we wish it well and look forward to catching more glimpses of it in 2014.